Welcome to the only network shining a spotlight on local sports in the greater Toledo area. BCSN is a locally produced sports channel with a full focus on our community 24 hours a day, 7 days a week. In short, it's sports played by local athletes, covered by local professionals, and enjoyed by local fans. BCSN is seen exclusively on Buckeye CableSystem. For the past seven years, BCSN and Buckeye CableSystem have dedicated themselves to spotlighting the surrounding community. With more coverage of high school, collegiate and professional sports than anyone in the area, we continue to be Northwest Ohios home for local sports. BCSN went live on January 7th, 2004 for a basketball game from Owens Community College. Since then, our mobile production units and crews have traveled the city and state to bring the big game to the fans at home. 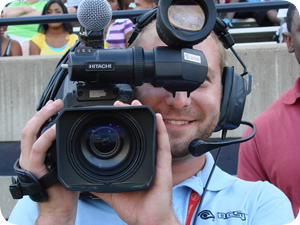 In addition to high school and collegiate athletics, BCSN is the television home for the Toledo Mud Hens, the Triple-A affiliate of the Detroit Tigers, and the Toledo Walleye, the ECHL affiliate of the Detroit Red Wings and Chicago Blackhawks. Behind the scenes BCSN utilizes the talent of local students and professionals on our crews and continue to work with universities, like Bowling Green State University and the University of Toledo to give students the necessary experience to start a career in broadcasting. In front of the camera we have benefited from the expertise of notable coaches and former athletes to provide analysis for various sports. Besides our daily coverage of local sports BCSN sponsors several All-Star games for high school seniors and provides free sports camps for middle school and junior high students. BCSN contributes over $40,000 annually to local students and teachers through our Student & Teacher of the Year programs and regularly supports area schools with program ads and donations. BCSN is seen exclusively on Buckeye CableSystem. You cant get this with a dish.